When managing User Roles in Brandkit, we talk about Portal Abilities and Admin Abilities. Abilities are essentially things that a Role can do. Below we define and explain each Ability. If an exemption is requested, Admins will receive an Exemption Request notification and must either Approve or Decline the request. We recommend this is OFF for most Roles. The user can created Saved Baskets (i.e. a saved collection of assets). We recommend this is ON for most Roles. The user can download without having to Login. This is a special option used rarely, and typically when you want to allow the public (without logging in) to be able to download from a Portal Page. Note any direct downloads will be anonymous (no tracking possible). The user (once logged in) can Download any Assets assigned to this Role. The user can view assets in a light-box view (a modal window with background blacked out) to help you focus on just the image. The user (once logged in) can Request Assets. This is typically turned on when Asset Download is turned off) and used when you don't want users to be able to Download without specific approval for each download. We recommend this is OFF, if Asset Download is ON. The user can send Assets to 3rd parties via an emailed link to a special pickup page. The 3rd party can then download the sent asset files, without the need to register or login. Brandkit will track who the email is sent to and whether the Assets are picked up, but anyone with the link can download. 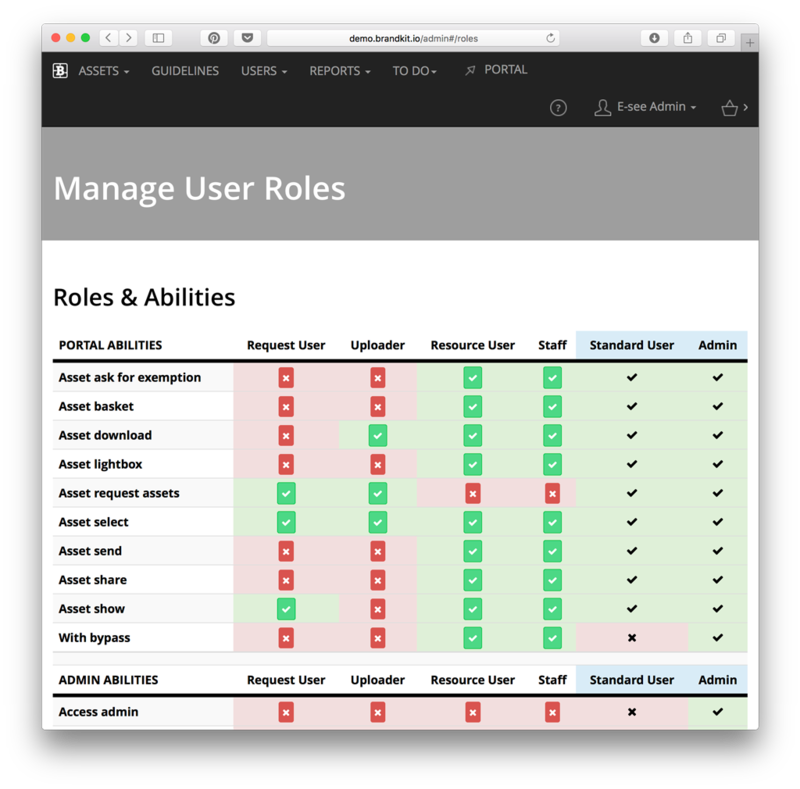 We recommend that Asset Send is ON for higher level Roles can Send and OFF for lower level Roles (such as external users). Also sometimes referred to as eCourier functionality. The user can share a selection of Assets with 3rd parties via an email link to a special view in your Portal. Assets will respect any visibility or access rules you set for Users an Asset Licenses. The Receiver must be logged in to take any action. The user can view Asset Detail pages. The user can utilise Multiple Baskets. Multiple baskets is a paid Premium Feature and so you may/ or may not not have access to this feature. The user does not have to complete Intended Use questions when downloading. Typically reserved for Staff roles. We recommend that this is ON for higher level Roles and OFF for lower level Roles (such as external users). A user belonging to a Role that has any of these abilities turned on, is deemed to be an Admin user for the purposes of pricing/billing. In other words, would require a paid Admin user subscription. For standard Admins - all these Abilities are ON. But we can configure custom Admin roles, e.g. an Editor, which have selected Admin abilities. The user can access Admin functionality. Will see the Admin (spanner icon) button in Navigation. The user can access, run, view and export reports. The user will be notified when either an Exemption Request or Asset Request is received and can View, Approve, Decline or Delete such Requests. The user can Approve assets to appear in the Portal. The user can Archive assets. The user can Delete assets. The user can send batch Email Updates to user by Role or to users who have previously selected one of the selected assets. The user can merge two assets together to remove duplicates. The user add Asset Relationships. That is relate two or mores assets together. An example of this would be adding a relationship between two assets, a Photograph of a celebrity and a Talent sign-off agreement. The user can batch delete assets (via the Basket). The user can Regenerate the optimised video files, if they fail to generate correctly on upload. The user can force an Asset Sync to see the latest data. The user can apply exisiting Approved Assets to assets. Note: This is not the same as Create new Approved Tags. The user can assign a Role to a user. The user can upload files to create assets. The user can export asset meta data as CSV for bulk meta data updates. The user can import asset meta data from CSV (exported wit Export metadata). The user can view, manage and invite users.